August has been another big month, and the newsletter is filled with more good news! We've released a SHaRE Surveys update and Performance Management Review functionality is now available. There are also snapshot videos available for this functionality. Wellness at work, simple habits for a happy workplace - Unplug and live mindfully in a digital world. New releases: SHaRe Surveys and Performance Reviews. Reminder: Performance Management - Complimentary Review Form / Process set-up. Congratulations to Kate Burns and Brooke Dowling from the team at Southern Cross Dental, who have both been nominated by the team here at Subscribe-HR as Customers of the month. Both Kate and Brooke were extremely helpful and had a really pro-active attitude during the setup process of their Core-HR solution. This contributed to a smooth, efficient implementation process and Southern Cross Dental are now up and running. We welcome them to the Subscribe-HR family. In August, we continue with another monthly Wellness Habit. This month we look at the importance of unplugging from your digital devices and taking the time to live mindfully in a digital world. You can access this month's Wellness Habit by clicking here. 3. New releases: SHaRe Surveys and Performance Reviews. O August 20th, there were two new release items available in the Subscribe-HR system. The SHaRe Surveys solution was updated with new functionality added and Performance Reviews will be available. Customer Care has created two video snapshots regarding these releases. On the Subscribe-HR customer login page, look for the link at the bottom of the page regarding the latest release information / update. On the Subscribe-HR Wiki, which will have details about the functionality that has been released. 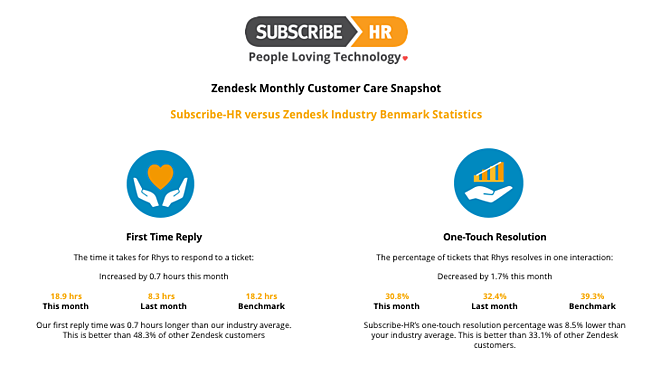 Via the 'New Release Widget,' which will be located at the top of the screen when you login to Subscribe-HR and will direct you to the ZenDesk Release notes. Please contact Rhys in Customer Care with any questions regarding this system update. We are currently working on enhancements to the Workflow solution to improve functionality and increase the level of efficiency that it will provide to end users. The Workflow enhancements will be available in the system before the end of the year and we will provide you with a further update about the release date in October. Don't forget that we are offering you, our Customers, the opportunity to have your Performance Review process set-up in Subscribe-HR, as a complimentary service. The Subscribe-HR (Pi) solution really is revolutionary in terms of the tools made available for configuring a Performance Review. We are confident in saying that Pi allows you to set-up and conduct your appraisals in a fraction of the time. Attachment Fields, and much, much more. We will be reaching out to you directly during September to arrange this complimentary service.